A. A. Billson's Dandelion Ale Beechworth & Tallangatta. An early "Ginger Beer" bottle made by the Bendigo Pottery. These can be found with either the small or large Bendigo stamp which include the "Coy Ltd" letters. As recorded in Paul Scholes' book "Bendigo Pottery" these stamps were officially shelved in 1898 (although some use after this probably occurred). In addition Billson's business was incorporated in 1897 to become A. 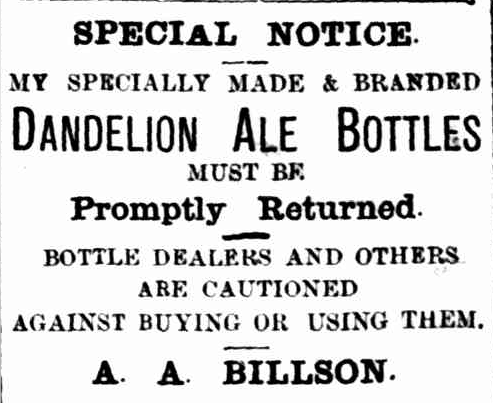 A. Billson & Co Pty Ltd and this bottle has only the earlier A. A. Billson name. Just to confirm this dating we've also stumbled across the advertisement below which ran in the Yackandandah Times in November and December 1896. The appearance of this advertisement suggests these bottles were fairly new at the time and when combined with the previous information give us a very good idea of when these bottles were manufactured. Dating where they are found can be a bit more problematic however as anecdotal evidence of previous finds plus the large proportion of these that have extensive usage wear and lip chipping lead us to think that many of these bottles remained in service until well into the early 1900s.